Life...as I see it: #53 With A Bullet?? Okay, you all know that I spend a lot of time on the internet - a real lot of time!! The other day I came across an article titled The 100 Greatest Artists Of All Time, which intrigues me to no end as I am a major music lover. Come to find out it was a Rolling Stone magazine article from 2004. Many, many years ago I was a regular Rolling Stone reader. I had subscriptions and enjoyed knowing what was up with the music world. And Rolling Stone was and has been the preemptive music magazine for decades. So back to the article - the first 50 are called "The Immortals" and number one on the list, of course, is The Beatles; #2 Bob Dylan; #3 Elvis - okay so far. #4 Rolling Stones (huh?) #5 Chuck Berry (he did sort of invent rock and roll) #6 Jimi Hendrix; #7 James Brown (not one of my favorites) #8 Little Richard (????) #9 Aretha Franklin, (queen of soul) #10 Ray Charles! So, I'm wondering where is Eric Clapton, guitar god extraordinaire, if he's not in the top 10? Well, come to find out, he's not even in the top 50!!!! What is up with that? There he was at #53 - Eric Clapton, who single handily changed the way guitars were played and perfected heartfelt white man guitar blues. And most of his success was while he was in the midst of highly public drug and alcohol addictions, which, thankfully he cleaned up in the mid 1980s. #18 Marvin Gaye??? WTF is up with that one? He was a singer, not a musician! Boy, am I getting pissed all over again. And where the hell is Pink Floyd??? 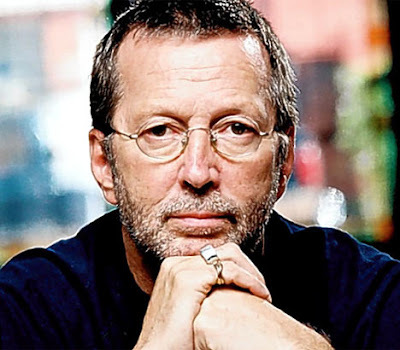 #53 Eric Clapton - what an insult to him, his talent, his songwriting and his fans! #66 was Cream - named for the "cream of the crop" when Jack Bruce, Ginger Baker and Eric Clapton joined forces for the first "supergroup." Well, come to find out, Pink Floyd did not even make the top 100!! Unbelieveable. But at least AC/DC at #72, and Radiohead at #73 were (heavy sarcasm)!!! The list goes on to include The Beastie Boys, The Stooges, N.W.A (again, who are they?) Tupak Shakur was #86 (who was known as Onepak after one of his nuts was shot off.) And, last and certainly not least (again, heavy sarcasm) at #100 is Lee "Scratch" Perry. Granted, some of these artists that I haven't heard of because they were more behind the scenes, or, more likely, music that I didn't listen to. But really, Public Enemy and Janis Joplin weren't (even on a good day) "greater" than Clapton or Floyd. I suppose that I'll get over this in time, but I really had to share my outrage.